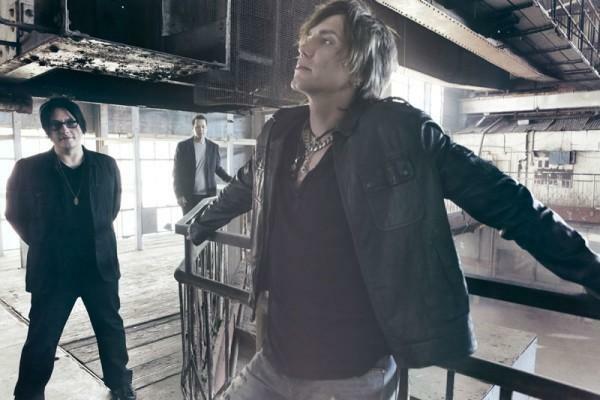 After laying low for the last couple of years, the Goo Goo Dolls are back. The band, who’ve moved over nine million albums and recorded monster hits like “Iris” and “Slide,” once again stormed the Billboard Charts with their latest album, Something For The Rest Of Us, which debuted at #7. We talked to golden-haired lead singer Johnny Rzeznik about the new record, writer’s block, Death Cab For Cutie, Paul Westerberg, “Iris,” OutKast and Obama. Tell us about the new album. How long have you guys been working on it? We’d been working on it for a while. We recorded it in Buffalo, L.A., and Nashville. Then we mixed it and went back, listened to it and thought, “Nah, we can do better.” So we went back into the studio for a couple of months, tweaked things, remixed it with a different mix engineer and found that we had something we really enjoy. So yeah, it was a long, long process. Are you a perfectionist when it comes to recording an album? You guys wanted songs on the album to address people who are going through hard times. Was there any particular instance that inspired that concept? Well I’m a news junkie. So I watch the news all day and then I sort of gave up, because it was just constant bad news. And in between the bad news there were all of these pharmaceutical commercials about what I was dying of. “If you’ve got this symptom, call your doctor! Get these drugs!” It’s just this constant ambient fear and anxiety that goes on, and I think it’s really starting to affect people. We live in a country that is on high alert all of the time, and I think the chronic stress from that is really starting to affect people emotionally as well. I wanted to deal with the emotional underpinnings of living in that kind of society. Yeah, we are in a very bad economic downturn, we’re fighting two wars, and I think people are starting to get fatigued from it. I was reading through the lyrics of “Not Broken” which is doing very well on iTunes, and they seem to be encouraging and uplifting. What’s the story behind that song? I mean, how many thousands of people, husbands and wives, boyfriends and girlfriends are going through this. Their lives are permanently changed because of someone’s decision to send them off to a war that we aren’t sure is right or wrong. And I’m not passing judgment on the war by any means. It’s just a question of, “is it right or is it wrong,” and are you willing to give up a generation of young men to fight for… whose interest? Exactly. That experience changes them forever. They aren’t the same person and they will never be again, which is very sad. Yeah, and in that instance I felt I wanted to write a love letter from her to him, so it kind of just turned out that way. Is that what “Soldier” is about as well? “Soldier,” to me, my interpretation of it, I sort of used that as a metaphor for alcoholism. My father was a big alcoholic and, you know, we’ve all had our own personal struggles with it. That’s why in a sort of an oblique way, I use the term “soldier” as kind of a metaphor for the battle that you’re fighting every day. It could be the battle that men and women all over this country are fighting every day trying to find a job, trying to keep their homes, trying to keep their families together. I have friends who have lost their homes, and it’s pretty devastating. They lose their jobs; they lose their home and it affects the family. Everyone desires food, shelter and some security. They’re willing to work for it, to give up everything for it, and then to have it all snatched away from them by a bunch of greedy bankers playing tricks on Wall Street — that’s intense. I’m surprised that there hasn’t been more public outrage about it. Yeah, you’ve definitely been watching too much of the news. I’ve started doing this thing where I have “news fasts.” I will not watch the news for days. Well, you’d be hard pressed to find anything uplifting on the news. Yeah well, besides those days where they’ll have a bulldog riding a skateboard, or something but I don’t need to constantly be reminded of the problem. Why don’t you focus on the people who are trying to come up with some form of a solution. I think people are starting to become as disillusioned with the current administration as the past administration. I just feel sorry for Obama. I just don’t know if you’d want that job. I think they have a secret set of cash and prizes that they give them on the way out. There’s got to be some sort of carrot on a stick to keep going. What about “Home?” How did you guys choose to use that track as a single? We felt like it was something that was different for us. Our record company generally likes to release something very safe and we were like, “Come on man, lets do something that’s more up-tempo and kind of sounds a little bit different than what we normally release as singles. We had our conversations back and forth about it and finally we prevailed. I thought it sounded a little bit different than what they would normally release, and I think that’s a good thing. About the new song “Hey Ya,” did it cross your mind during the recording process that fans might assume, via the title, that it was a throwback to OutKast? Yeah, the song sounds nothing like OutKast’s version. How long has it been since you’ve been on the road? We started touring, not in support of the album, we just went out and started playing gigs when we were done with the record. We were playing new songs off the album, which it actually turned out to be a good thing to play the new songs because they went out all over YouTube. People started showing up at the shows, knowing those new songs and singing along, which is really awesome. How have your fans been reacting to the new material? Really positively. They really seem to dig it. You know, writing to me is a selfish process in a way because you’ve just got to write what you’re thinking about and write what you believe in, and that’s a big risk. I can’t think about what’s going to happen once it’s out of my hands. I can’t think of how my audience will respond to it. I have to just speak my mind as honestly as I can and hopefully they’ll react to it. If people relate to it that’s great. If they don’t, that’s just the way it is. You know, we’ve had some humongous commercial success, and some not-so humungous commercial success. That’s just the way it goes. From my experience, songwriting is an extraction of life from personal experiences, giving it form, balance and a stage to tell a story. How do you personally approach the songwriting process? Once I have the music written, I listen to it to see how it makes me feel, what kind of thoughts it provokes in me. And it’s very closely related to what’s going on in the rest of my life and in the outside world. In that respect, it’s kind of a cathartic experience because you just start writing pages and pages of stuff. You need some place safe where there’s no judgment from anyone to do your work. You have to nurture that process. What songwriters have been the biggest influences on you? What music have you been listening to lately? What’s on your iPod right now? Lately I’ve been listening to David Bowie and Queen’s “Under Pressure” and Tegan and Sara. Oh, OK this is pretty funny! This is all I have on my iTunes: Lou Gramm’s “Midnight Blue”, a song called “Heartbeats,” a cover by this band The Knife, The Scorpions’ “Rock You Like a Hurricane,” and Annie Lennox’s “No More I Love Yous”. Also, I love Death Cab for Cutie. They’re really, really brilliant. You know, I don’t throw that word around a lot but that band is brilliant. Which of all of your songs are you most connected to? Oh, “Iris.” I mean that song was such a gift. That thing just dropped in my lap. It was one of those situations where you’re sort of having this spiritual moment, and you just have no clue where it came from. It was really cool. Before you wrote “Iris,” you had a pretty severe case of writer’s block. How’d you manage to cure that? I think I needed that. I think it was a period of time where I had to sit down and come to terms with the fact that I was having a hard time with my identity. We’d made five albums, and then all of the sudden we had this hit song, “Name.” I got this feeling I think a lot of artists get: that I am a complete phony, that was just luck, and I don’t know how to do it again. It felt like I had just won the lottery and everyone was standing around going, “Wow! You won the Lottery! That’s amazing! Do it again!” So it really kind of froze me up. I think it was the period where I finally had to come to terms with the fact that songwriting was now my job. Before that, even during A Boy Named Goo, we still had day jobs so it was a situation where I was always a songwriter and a bartender. I was always a songwriter and whatever other job I had. Then when it became my job it threw a lot of fear into me. I had to learn that the job of songwriting is incredibly frustrating. It’s sort of paradoxical in a way because you have to learn to sit in that discomfort and accept it, accept that the frustration is going to be there and you just have to look at it and go, “Oh, there’s my frustration. Well I’m going to keep working through it.” You keep writing. You have to write through it. The only way out of it is through it. So you write 25 really bad songs. So what? You just keep moving in the face of that frustration. If you keep moving, the frustration loses it’s power, and you really start to come up with some good material. How have you guys managed to stay together for 24 years? I kid around about it being a marriage of convenience. You know, like we’ve been together so long nobody else wants us. But seriously though, we’ve learned to respect each other’s boundaries, we’ve learned to shut up and listen to each other when it’s time. We’ve learned to accept each other’s suggestions and quirks and that’s really what it’s all about. It’s like, “I’m either going to fight with you or I’m going to accept this about you. We’re not going to try to chance each other because we’re never going to change. So let’s learn to work within the parameters of our relationship. Now that being said, that changes the complexion of your relationship. Robbie is married, Mike’s married, I’m going to get married; and it’s one of those things where you start to have your own life outside of the band. Whereas when we started out Robbie and I lived together, we partied together, we did everything together. We have become a family. We see each other on holidays, but yeah people need their own space to grow their own life, and hopefully the band can continue to grow with that.